According to the prosecutor of the Flagrance Unit of Ambato, Patricia Velásquez, the Cuban confessed without being asked to be the author of the murder and maintained that he would do it again. 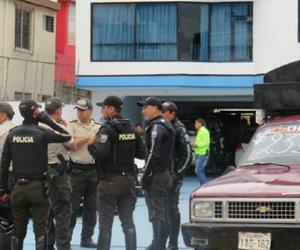 The victim was identified as Vicente Vásquez, 67 years old and originally from the province of Pastaza. The body was found in one of the rooms of the Cuban home. According to the prosecutor, the corpse had several wounds on the part of the face and one at the level of the jugular. He also stated that the crime was committed with a knife and that, presumably, it was to defend against a supposed robbery. However, after investigating the location of the event it was verified that there was no such robbery, since the victim did not attempt to take any belongings. The wife of the alleged perpetrator of the crime was the one who notified the National Police, alleging that there was a deceased person inside the home.